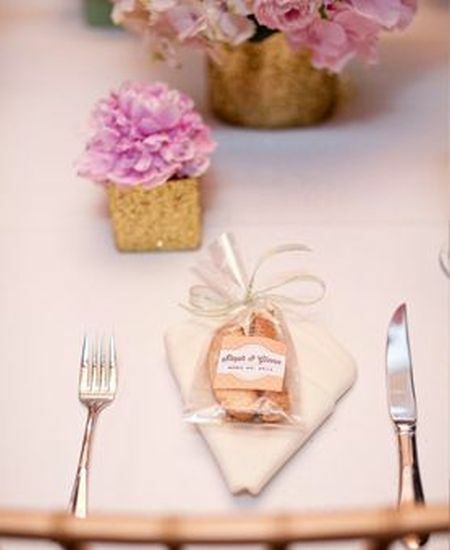 Biscotti wedding favors are a unique way to honor romance in the form of a cookie. But first, you may be wondering, "What is biscotti?" It is a long, thick nut flavored biscuit originally baked in Italy. Biscotti history tells us it is a traditional Italian wedding cookie and it's name means twice baked because that is exactly what happens to it. The dough is baked the first time in a log shape, and then it is sliced and baked again. This creates a crunchy, hard cookie that Italians love to dunk in coffee, wine and many other beverages. It is usually baked with almonds, but can be made with other nuts instead. Available in a variety of flavors including cherry, banana, or apricot makes them appeal to everyone in good taste. 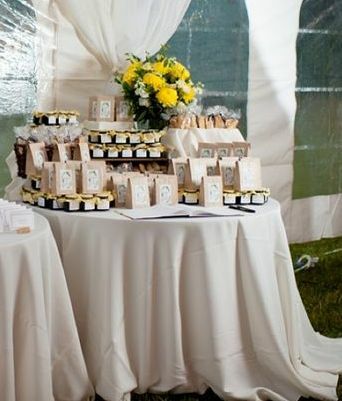 Today, this traditional cookie can be dipped in chocolate and hand-decorated to become a perfect wedding favor. Any photo or text can be printed on the chocolate to make a unique, personalized cookie. This lends a contemporary or modern twist to a traditional biscotti cookie. When favors are grouped together, the impact of the treats together becomes a decoration in itself. This presentation becomes more elegant with the addition of flowers and tablecloth. A thoughtful gesture lends a wonderful surprise at the table setting. 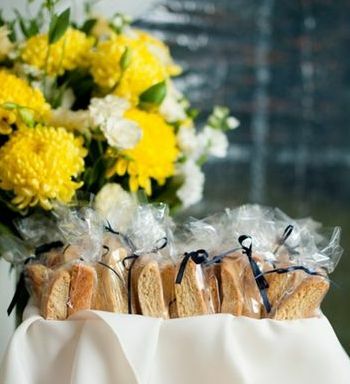 Biscotti can be easily placed in a clear bag, tied with a ribbon, and placed at the table. 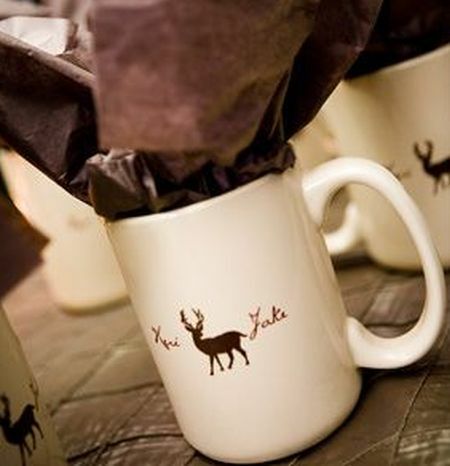 A personalized mug is a natural choice to hold your biscotti wedding favors. You can let go of formality and embrace everything that speaks comfort and ease. You may think glass jars are a bit old fashioned, but they can clearly be an interesting element to any table. 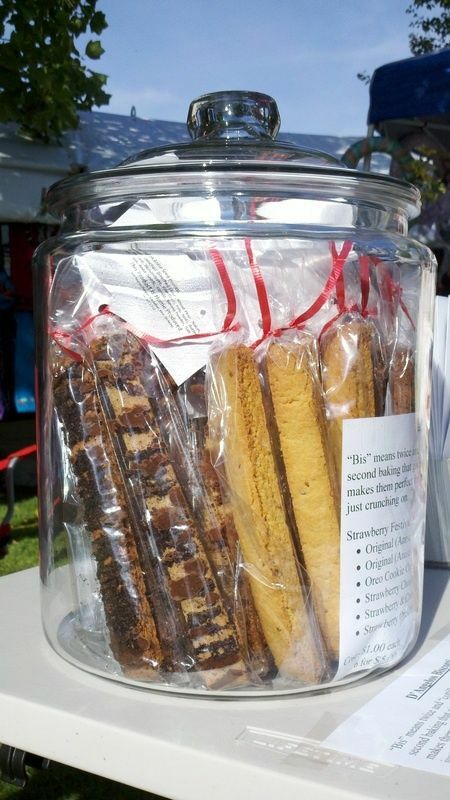 This practical cookie jar is filled to the rim with biscotti. What you see is what you get. Biscotti is often referred to as a dipping cookie. Beverages such as coffee, tea or wine are popular choices. 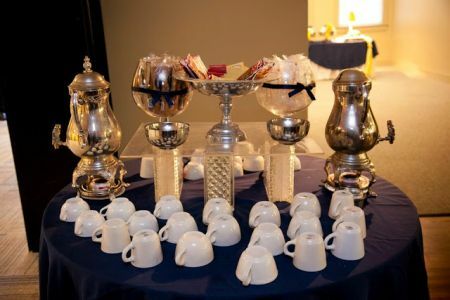 Whatever beverage you are serving, enhance the visual impact to coordinate with the theme and tone of your celebration. 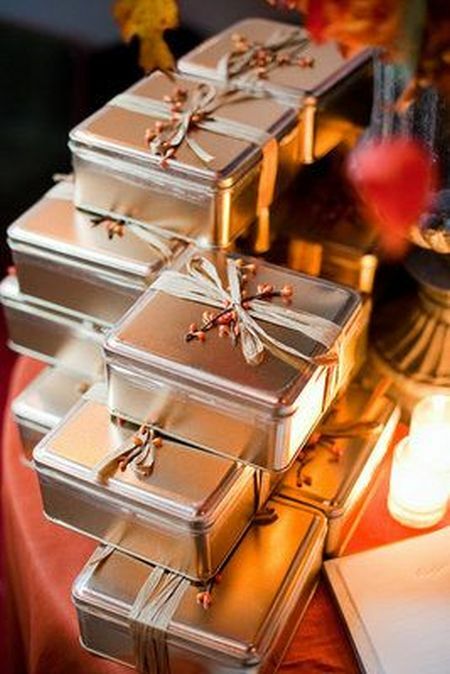 These tins are simple, elegant, timeless, and the perfect choice for biscotti. The tiny raffia bows and floral embellishments make a pretty presentation. 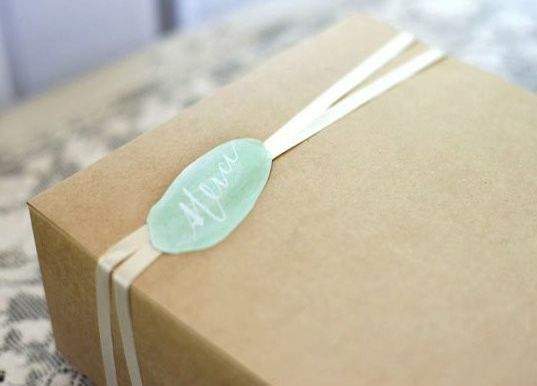 Details can enhance the feeling that a wedding favor already offers. 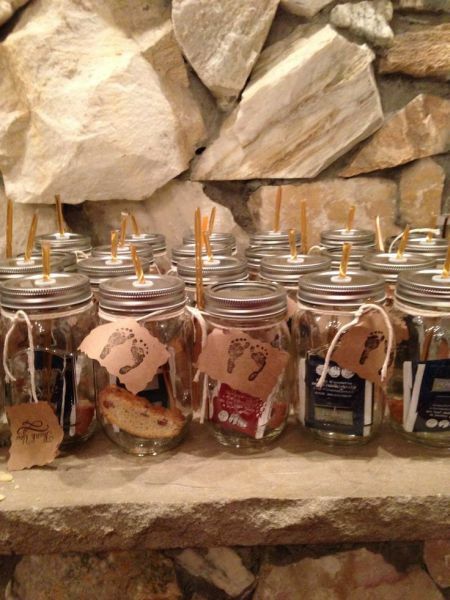 Here, Mason jars are made wedding worthy with a little creativity and details that reflect its vibe. 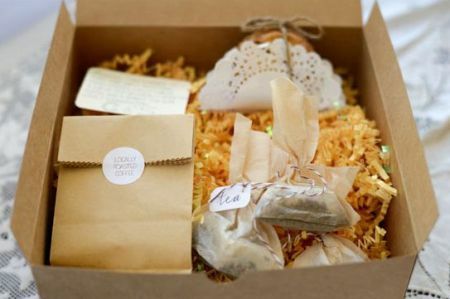 Your guests will not only enjoy the biscotti that you have tucked inside, but also the little extras that tie everything together. The gourmet coffee and loose-leaf tea are finishing touches that always go down well. 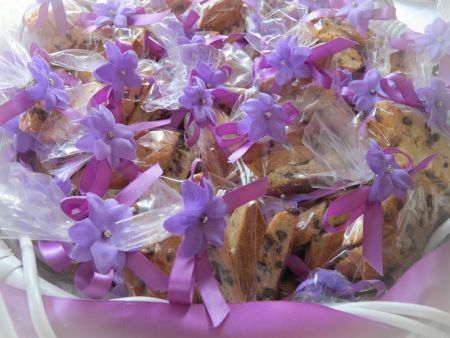 A single lavender violet adds a dose of glamour to these biscotti wedding favors. The white basket allows the color of the flowers to be the center of attention. 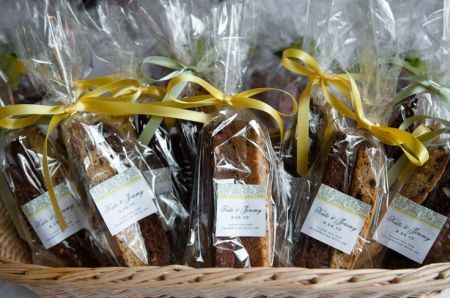 Offering biscotti in clear bags is a classic choice. If you believe less is more, you'll no doubt be tempted by this simple combination of a personalized tag and a dainty ribbon. DIY biscotti. 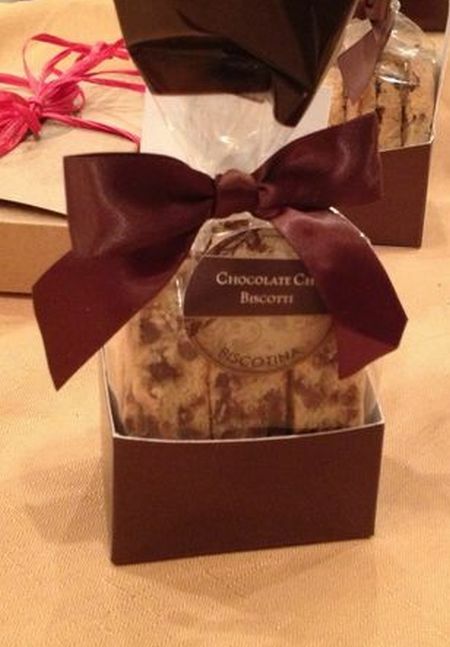 There are numerous biscotti cookie recipes easily found on-line. This baked goodie gets better with age and has a longer shelf life than other cookies.